Normandy Life: Mosaic Monday # 25. 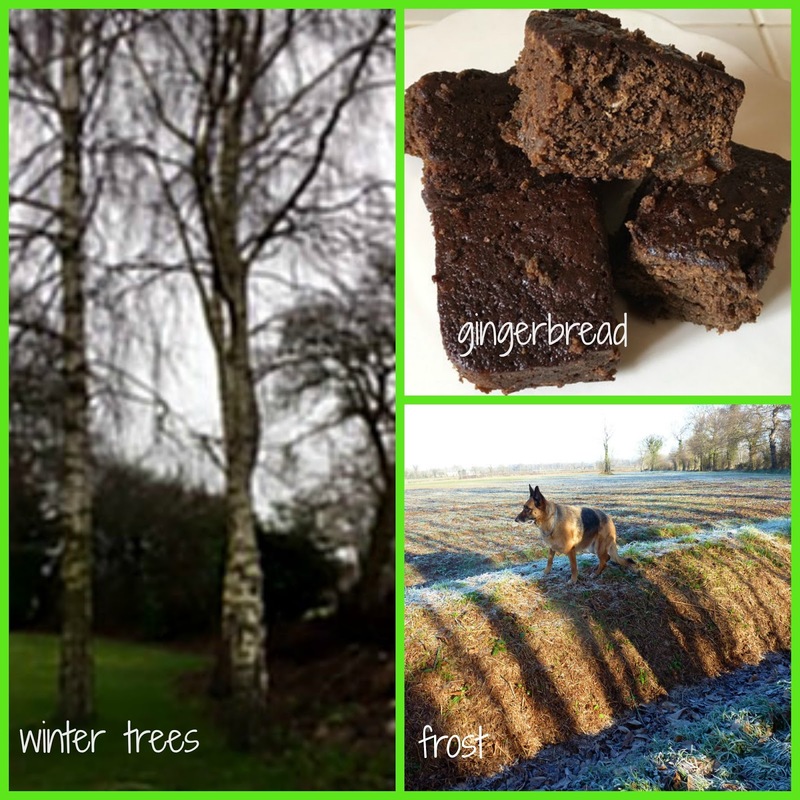 Winter Snap Challenge. Mosaic Monday # 25. Winter Snap Challenge. I'm back on home turf for my Mosaic Monday post this week sharing with you some images taken around and about as part of the Winter Snap Challenge currently happening on the UK Scrappers website. If you would like to learn more about the challenge, which runs until the end of February, and maybe spark your own winter photography (or even your scrap booking) mojo into action then click on this link to my justscrapping blog for more details. The mosaic below includes one of the WSC prompts, # 13 - a sign of spring, we've had daffodils blooming in this sunny spot since Christmas. The shot below it was captured on the beach at Colleville sur Mer on a very frosty morning, I've never seen frost covered sand before. The final photo in the triptych is of our back garden, all three were taken with my new iPhone which was a gift from the SP at Christmas. I love having it in my pocket when out walking, the freedom to point and click whenever I want to is quite heady! Gingerbread - yum. My Aunt made gingerbread loaf when we went to visit her recently. Have a fabulous week. It must be lovely to see the flowers creeping into your garden. Excellent snaps. Frost on the sand is different to see. Aren't the new phones fun to take pic with and they are so good. Our Daffs are up and budded but not blooming yet. Thanks most sincerely for hosting me today, sweet, darling Maggi ! January looks darn good in Normandy! Your daffodils make me smile ...great to have them so early and I'm a bit envious because we don't see them at all nowadays...it is too hot in Florida and they are done by the time we get home to Oregon. Thanks as always for hosting and for sharing the beauty you see. A wonderful selection of shots, Maggie. Hope you are keeping warm. You are so lucky there seeing already daffodils - we have to wait for another two months. Wishing you a great week! 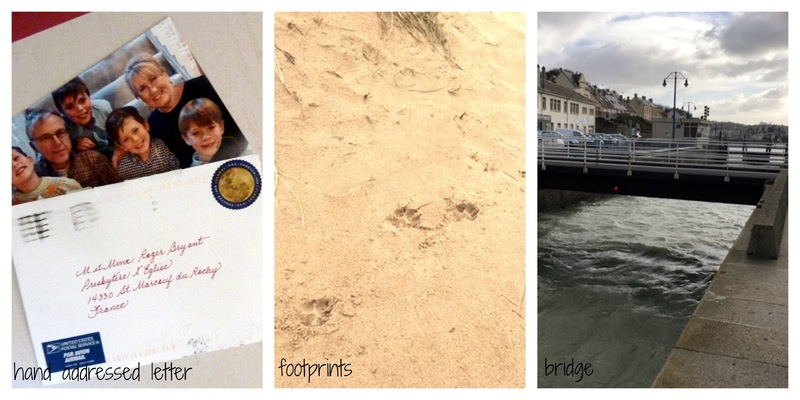 So various and beautiful snapshots in your collages! 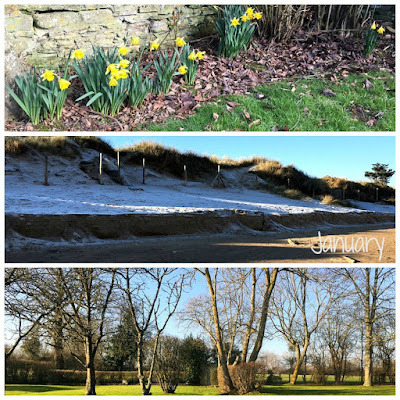 daffodils and a frosty morning at the shore in january...Lovely! And little Fleur is so cute! Have a pleasant Monday and great week, too! Good Monday morning from the Pacific Northwest Maggie. You found some great signs of Spring. Daffodils always make me smile. I will have to click over and see the challenge. Hope your week is splendid! Thanks for hosting. It looks very springy there indeed! My daffodils won't make an appearance until sometime in May and we're currently in the middle of a snow storm. But there's hope. Pretty photos, Maggie. Thanks for hosting. Ice on sand, it must have been very cold indeed. Thank you Maggie for Mosaic Monday 25, peeks of daffodils are a treat. I went to Blissful Solitary Wanderings and was amazed at the beautiful photos! She is google + only so I can't leave a comment. I hope she sees this and knows how amazing her photos are! Thanks! I saw daffodils popping up around here the other day too! I have never seen gingerbread that is so dark brown...it almost looks like chocolate! I can bet that it is rich and full of flavor! I have had my iphone for several months now and I like it a lot. I never thought I would want one...oh well...never say never, right?! Have a great week and thank you for hosting! Your mosaics are all great, and I love the idea of the snap challenge. I went to your other blog and see that you've made a lot of progress already. Spring looks to be not far away in your corner of Normandy. A cup of tea and bit of gingerbread makes a nice treat on a coolish day. Have a great week, Maggie and thank you for hosting MM. Love the triptych! I should make one. Maggie what an interesting assortment of photos for the Winter Snap challenge! Your Gingerbread looks like one I make - a recipe handed down from my mother! As young busy children it seems we were always ravenous and the Gingerbread was a staple in our house! I missed Mosaic Monday again this week. We have been busy, but there is also little happening in the garden and my readers I am sure will tire of the doll dresses that I have been working on. January is like that, isn't it? I always enjoy daffodil photos and I will check out your scrap book page. Wonderful photos and that gingerbread looks FABULOUS! Lovely to see your signs of spring!